Template tricks, hacks and tips for blogging like the webmaster you really are. You go on with your bad self. REMEMBER: If you use it, please link to it! Blogger Can Save Your Lost Posts! In a great move that is very appreciated, Blogger has upgraded their post-editing page with a nifty "recover post" link (see screenshot). I used this feature last night to rescue a post I worked on for 5 minutes. I pushed POST, and it dissapeared! Clicking "Recover Post" magically brought it back. Phew! Blogger is quick to say "This feature is not guaranteed to work every time you lose a post, but it's always worth a shot." Beyond that, you can read more about Blogger's Recover Post feature. One of the coolest blog helper-apps of all time, Feedburner allows you to take your Blogger Atom formatted XML feed and convert it to Feedburner's flexible format, which automatically switches to the best feed format for your site visitor's feed reader. Once you convert your feed, be sure you funnel all your feed traffic through it, and also check out these cool publicity tools. 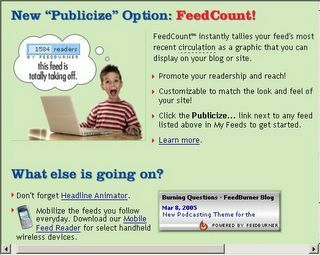 If you're using Feedburner to publish your feed or to transform your Blogger Atom xml feed into RSS versions 1.0 or 2.0, or to podcast, then be sure all your feed traffic gets piped through feedburner. This ensures that if any newsreaders or search engines scan your blog for an XML feed, it will catch your Feedburner feed, not your plain-vanilla Atom.xml feed. Of course, replace my feed information with your own, from feedburner. Personalize the link for the comments on your blog by using this simple hack by Blogger Templates. Blogger makes Web updates easy. At a minimum, all you have to do is write a post and click "publish" to see your page updated. When you submit a post to Blogger, it gets saved to our database and this is where Blogger tags come in. Blogger tags tell our blog publishing program which information to fetch from database and put on the page. "Please put the title here, the post right underneath, and then the date and time go here and here. Thank you." It's all very polite. Zhen posts a good tutorial on how to have only portions of your blog posts show on the main page. With this trick, you can choose to display an arbitrary amount of text from the beginning of each post, as a teaser for the whole thing. Then users who want to read the rest of the post can click a link to see the full text. This is handy if you have lots of long articles all on one page. Note that you'll need to have post pages enabled in order to make this feature work. 3 Fat Chicks have a cool weight loss tracker you can post in your blog, email signature, forum posting or just about anywhere else you can put a signature. Check out the tracker and get your own. Syndicating your blog is like having hubcaps on your car--you don't have to have them, but everyone who sees you will laugh out loud at you think you should spend some more time in Blogger School before venturing out in public. While some good primers on syndication exist on the web, it may be enough for you to know that its a cool way for people to have your blog follow them around the web through what is called "feeds". A feed is like an electronic ticker-tape of your blog's content that people can plug into a variety of other web applications. For example, they might plug your blog into their MyYahoo page, or their MSN page, and then they'll see your bold movie critiques or your newest dandelion photos every time they go online. Others might even link to your blog posts on their own websites, along with comments like: "look how cool this guy is!" However, if Syndication is like hubcaps on your car, allowing people to syndicate your content with their choice of format is like the steering wheel. Currently, Blogger only outputs feeds in Atom format. However there are others. RSS 2.0 being the most commonly desired. If only there was a way to reformat your Atom feeds into RSS or other formats... hmmm. Point-N-Click has a page where you can copy some code to allow you to Google Search from your own website (or allow your visitors to search on their own). Click here to get the code for this hack. If you adjust the number in the size="25" attribute of the <input type="text"... tag, then it will make the text box smaller (less width). The maxlength attribute should stay where it is. Having these two set differently allows you to type a lot of text into a small textbox. See the Point-N-Click homepage to see how this has also been reworked into the small right-hand column of the site. Movable Type & other templates allow you to have a link bar across the top and bottom of link posts with links to the previous item and the next item in your blog, by title. You can do this in Blogger now, too. While hacking the Kubrick template for Point-N-Click, Michael Heilemann included this very cool hack. This line of code must be outside the Blogger tags. If you have to, close the Blogger tag (</Blogger&rt;), paste the code in, then reopen the Blogger tag. Right now, this will only show up on Post Pages, the pages of your individual items. To show on all pages, remove the <itempage> and </itempage> tags. It seems the best place for this is at the top of the posts on the page. 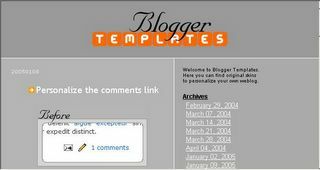 In most Blogger templates, just before the Blogger tag is opened the first time is usually great! Use this hack, combined with StatCounter's free website stats application to graphically show your page stats on a website of your choice. See an example on this page. Copy the following code to your website, editing the first two variables (see comments in the code for details. Note: Please keep the web friendly--if you use this hack, link back to this post! Please post a comment to the Wishlist if you are looking for something specific. And, please remember that this is linkware... it won't cost you anything but a few kilobytes. Just link back to this site, templatetricks.blogspot.com if you use any of these ideas. It's only fair. Besides, if you link to me, I will link to you! And, if your site is interesting to me, I will add you to my newsgator and then the whole world will know about you. Wanna know something? Post a comment here and we'll all laugh at you see what we can do about it. There's nothing like getting stuff for free. These offers are a lot like that! Netscape Internet Service - Unlimited access, personalized email and search enhanced by Google. Try it! Only $9.95/mo. Up to 5X faster than regular dial-up! Try PeoplePC Online Accelerated 3 months, half price and then pay just $15.95/month. Download CallWave (Free!) and never miss another call while you're online. This blog is why blogs were invented. Like the kicker says, "Save your bandwidth, the cool stuff is already here."